The annual Martin Luther King Jr. breakfast and Day of Service will be held Monday, Jan. 21. The breakfast will be held from 8 to 9:30 a.m. in Billingsly Student Center’s Connor Ballroom. The cost is $10 per person and free for Missouri Southern students and children under the age of 5. Lyle Foster, assistant professor of sociology at Missouri State University, will be this year’s guest speaker. Foster is passionate about community, inclusion and empowerment. In 2015, he began the “Tough Talks” initiative at Missouri State to provide an outlet for dialogue on issues of diversity and inclusion for students and staff. “Tough Talks” has been presented at other universities and even expanded to Community Dialogues in Springfield. Foster writes columns for numerous local newspapers, and conducts workshops on issues of diversity and inclusion. He was honored by the NAACP in 2013 by receiving its “Drum Major” award. Doors will open for the breakfast at 7:30 a.m. Tickets may be purchased online or at the campus ticket office by 5 p.m. Tuesday, Jan. 15. The Day of Service will take place from 10 a.m. to noon, 1 to 3 p.m. and 2 to 4 p.m. Participants can choose an organization from a list of non-profits in need of volunteer service. 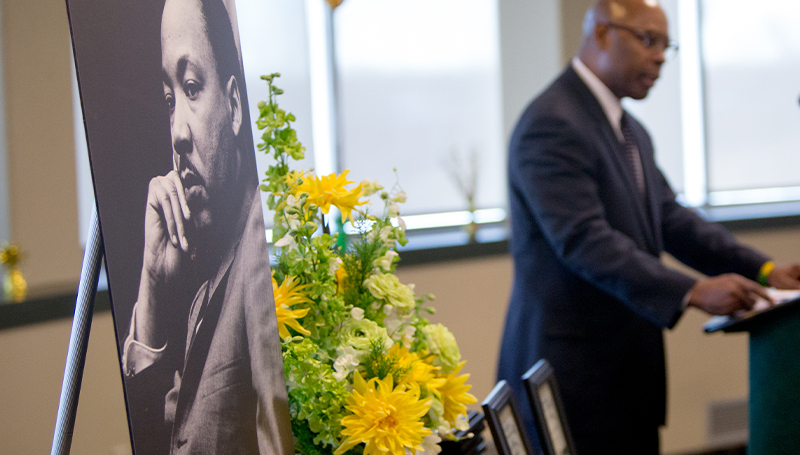 The list is available at www.mssu.edu/mlk. Specific times and services needed vary by organization, and the list notes which locations welcome children volunteers. To get involved, contact the organization’s representative directly by referencing the contact information on the list of non-profits.